Technology has changed our workplace and the tools we use to master our business by replacing the desktop computers with laptops and Ultrabooks and also enabling us to work regardless of our location. For couple of months I have been testing Fujitsu’s LIFEBOOK U904 as part of the Master your business campaign and put the Ultrabook through different tasks and tested how it performs. As the project has turned to it’s last third let’s see what have been my experiences. Also there’s still time for readers to take part and win an overnight stay at a Marriott hotel. It has been about three months since I got Fujitsu’s LIFEBOOK U904 to be used for the Master your business campaign with 16 other bloggers. 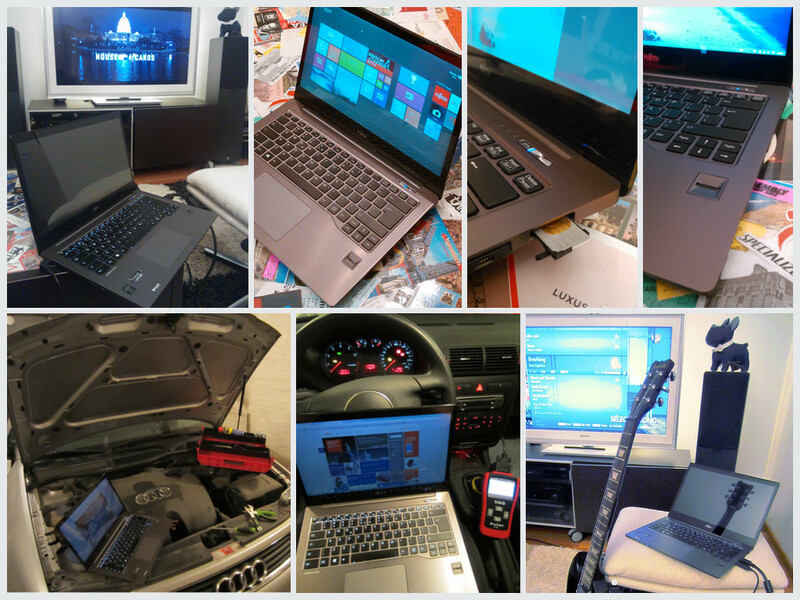 During that time I have put the Ultrabook through different tasks and tested how it performs to the campaign blog. This far I have explored the topics and features of LIFEBOOK U904 concerning its special features like display, touchscreen, security, vPro, explored what are Fujitsu’s services and solutions and though about how the workplace and changed and how the future workplace might look like. We also tested unified communications and collaboration tools with 10 other insiders and experts. The Master your business campaign has turned to it’s last third and there’s still five exciting tasks to fulfill although I have “earned” to keep my precious new Ultrabook. As I previously wrote the Fujitsu LIFEBOOK U904 is marble black with aluminium and magnesium housing which makes it robust and light. Behind the 14″ screen there’s brilliant IGZO touchscreen with 3200 x 1800 resolution and it’s run by Intel Haswell Core i5-4200U -processor and integrated HD Graphics 4400. It comes with Windows 8.1 Professional and 6 GB RAM and 128 GB SSD drive. To make it a perfect for mobile office the U904 is equipped with embedded 3G/LTE modem. You can also find full size Ethernet port, WLAN, Bluetooth and dock connector. Also the power adapter is now pretty small compared to previous models. Couple of months with Fujitsu’s second generation Ultrabook has been good and it still feels good although some aspects could be better. Notebook Check has made good review of LIFEBOOK U904 and on most parts I agree what they have to say about different aspects of U904. They also have some nice pictures also from behind the bottom plate. The multitouch screen is an edge-to-edge glass pane with 3200×1800 resolution makes single pixels are virtually invisible and picture is sharp. It also brings more usable scenarios for Windows 8 but it would be better if it could be turned around for tablet use with pen as the T904 is capable. I’m not quite adjusted to use the full potential of the 10-point multitouch screen but it works great. The display’s hinges are firm but the screen is still wobbling slightly when inputs are made. As the screen isn’t antiglare coated it can be annoying to use in bright environments. The chiclet keyboard works nicely and is responsive but is a bit tough to press and thus doesn’t have as precise and sharp feeling as in my Macbook Pro. And if the evening gets dark you can turn on the keyboard backlight. The touchpad is generous in size and smoother than before and inputs are accurate. The stereo speakers’ sound is a bit cold and hard but using headphones is fine. The connectivity is good with WiFi capable of 2.4 and 5.0 GHz bands but unfortunately doesn’t support the ac standard. The Wi-Fi card can be exchanged if required. The more interesting part is the embedded 3G/LTE support for situations where you don’t have WLAN. The ultrabook is is barely audible when idling but fan speeds up during load and the laptop starts to squeal even during simple load (fan speeds up temporarily) which is unpleasant. The machine is very cool in both idle and low load and doesn’t get very hot even with heavy load (due throttling). The battery runtime is great with light use and lasts for over 12 hours and with more active use with WiFi and surfing the internet you get about 6,5 hours. It takes about 2 hours to recharge. The serviceability and upgradeability are ok and by opening the bottom tray it is possible to access all important components. The batter is non-removable but you can upgrade the SO-DIMM memory module and the 2.5-inch size SSD. Also the you can access the fan for cleaning purposes. Although LIFEBOOKs are meant for business applications they can be also used for entertainment like light gaming. The graphics chip could be Iris Pro series but also the 4400 has enough power to run for example Mark of the Ninja, Dead Space, Rocksmith and Alan Wake. You just have to take care to leave the bottom’s fan outlet clear or the CPU and GPU throttles as the machine heats up. Also it seems that it does not max out its Turbo Boost. The machine performs nicely and is more than enough for office work and with the SSD there are barely any waiting times. The test results are somewhat higher than e.g. LIFEBOOK U772 Ultrabook which has Intel Core i5-3427U (1.8 GHz) and Intel HD Graphics 4000. It got 3DMark 06: 4501 and PCMark 7: 4146. Fujitsu LIFEBOOK U904 is the second generation of Ultrabooks from Fujitsu and is a solid business device and feels much better than the previous U772. The 14″ sized Ultrabook has elegant design, is ultra-slim and light but still robust with aluminium and magnesium housing. The IGZO 3200×1800 resolution multitouch screen is brilliant and sharp. The machine performs nicely and is more than enough for office work although under heavy load the CPU and GPU throttles easily. The keyboard and touch pad works nicely and pretty smoothly. For mobile workers the connectivity options are great with 3G/LTE and long battery runtime. Also the power adapter is now pretty small compared to previous models and is easier to carry with you. Here in Finland you can get the U904 from Verkkokauppa.com with 1900 euros. I’ve been testing the LIFEBOOK U904 as part of Fujitsu’s Master your business campaign with 16 other bloggers around the Europe and Middle East. Part of the participants tests the ESPRIMO Q920 minicomputer. The campaign will last about three months until 11.4.2014 and there will be 15 tasks for the bloggers to solve. 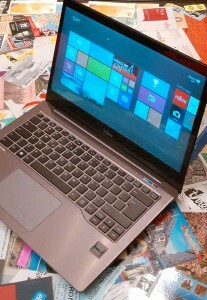 I have done the two thirds of the tasks so I can keep this nice Ultrabook. Also the readers can participate and win an overnight stay at a Marriott hotel. This far I have explored the topics and features of LIFEBOOK U904 concerning its special features like display, touchscreen, security, vPro, explored what are Fujitsu’s services and solutions and though about how the workplace and changed and how the future workplace might look like. We also tested unified communications and collaboration tools with 10 other insiders and experts. Read the detailed solutions from my campaign profile and for more insights about information technology follow me in Twitter. Check out the Master you business campaign site for more information about LIFEBOOK U904 Ultrabook and ESPRIMO Q920 minicomputer. There are lots of interesting articles and creative solutions to the tasks.